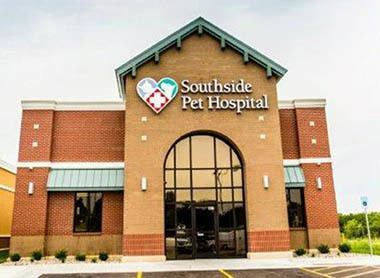 Southside Pet Hospital is a full-service veterinary medical facility, located in Olathe, KS. The professional and courteous staff at Southside Pet Hospital seeks to provide the best possible medical care, surgical care and dental care for their highly-valued patients. We are committed to promoting responsible pet ownership, preventative health care and health-related educational opportunities for our clients. Southside Pet Hospital strives to offer excellence in veterinary care to Olathe, KS and surrounding areas. We work hard to provide you with the best possible veterinary care at an affordable cost. Southside Pet Hospital was established in 1974 by Dr. Rodney J. Schieffer. The clinics first home was in a small site on South Water Street, Olathe, KS. In 1979, as Dr. Schieffer's practice grew and a larger facility became available, he moved to our current location at 231 E Dennis Avenue, Olathe, KS. Dr. David Gray joined Southside in 1979. Over the years, our goals have remained to provide our clients and their pets with the highest quality pet health care professional service. At Southside Pet Hospital, we are always glad to accept resumes from enthusiastic, hard-working, dependable, team oriented people who wish to join our team of veterinary health care professionals. Contact us to learn more today!